Make yourself at home in one of the 80 air-conditioned guestrooms. Complimentary wireless Internet access keeps you connected, and cable programming is available for your entertainment. Bathrooms feature shower/tub combinations, complimentary toiletries, and hair dryers. Conveniences include safes and desks, as well as phones with free local calls. At Comfort Inn near Barefoot Landing, enjoy a satisfying meal at the restaurant. A complimentary continental breakfast is served daily. 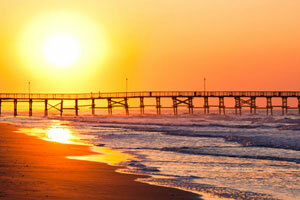 The preferred airport for Comfort Inn near Barefoot Landing is Myrtle Beach, SC (MYR).